Name a teacher you’re thankful for and why. What Thanksgiving food are you afraid to try? If you could invite anyone to Thanks- giving dinner, who would it be? What Thanksgiving food did you hate at first, but now you like? If you could travel anywhere for Thanksgiving, where would you go? State three things you love about your family. Share a favorite Thanksgiving memory. What is one thing you own that you would never sell? 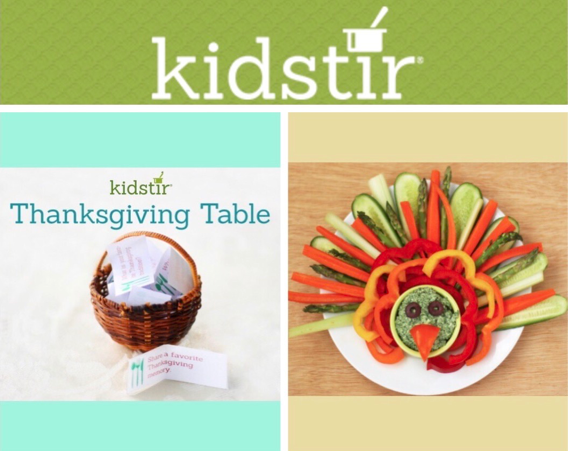 For more fun family games and activities, check out our collection of fun kids cooking games! Looking for a snack—and an activity—to keep the kids busy before the big feast? Let them get creative with our Turkey Time fun crudite. Then gobble up the veggies and spinach dip with just 15 minutes of hands-on time. Kids will work with six kitchen tools including a cutting board & knife, measuring spoons & cups, a garlic press, a spoon, a mixing bowl or food processor and a colander. Kids will learn several kitchen skills, measuring, using a knife, mixing, creative presentation. They’ll use ingredients like frozen chopped spinach, sour cream, cream cheese, grated Parmesan, crushed garlic, Salt and black pepper, Veggie turkey dippers (such as bell peppers, cucumbers, asparagus, carrots, celery, black olives). Last Chance to purchase a Gobbling Good Fixings kit! Don’t miss out on your Spoon It Up! tool and Cooking Fun Apron. Kidstir Popcorn Bread, Awesome Apple Stuffing and Zesty Cranberry Sauce make any occasion a special feast, including a festive Christmas dinner! Use code THANKFUL30 to get 30% of the first kit of a new subscription. Gobbling Good Fixings is only available till 11/20/16. Next post: Kids Gift Guide & Reviews!